Daniel Bell reviews the Nikon 1 J3 compact system camera which Nikon claims has the world's shortest release time lag and the world's fastest continuous shooting. The Nikon 1 J3 was launched in January 2013 alongside the S1 and is a compact mirrorless system with an extremely small body, fast continuous shooting and short release time lag. It is available with the 10-30mm lens in silver, red, white, black and beige for £485. 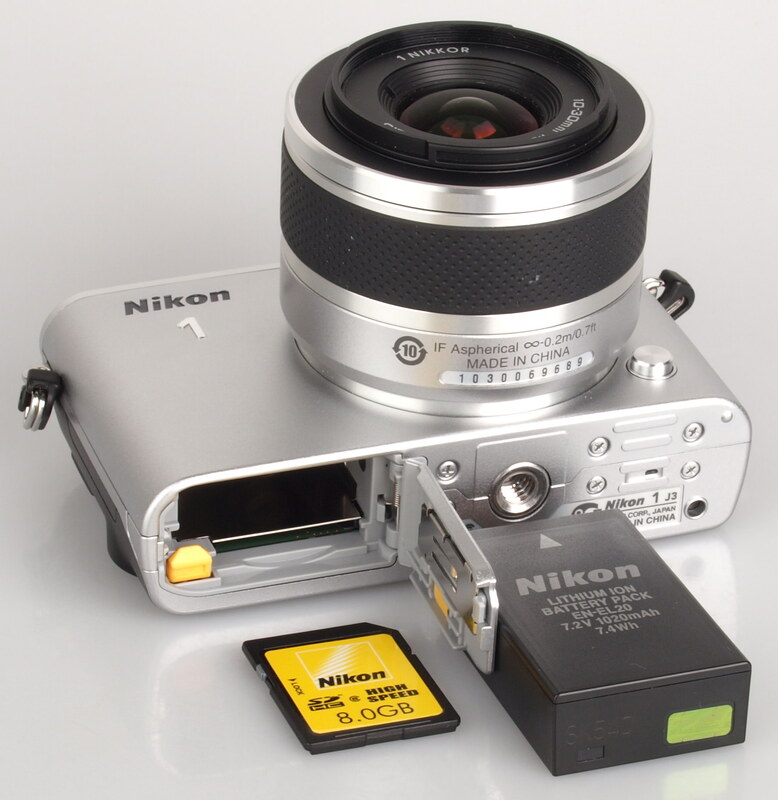 The Nikon 1 J3 has a 14.2 megapixel CMOS sensor which offers fast and accurate AF and ISO up to 6400. It can also shoot at up to 15 fps with autofocus and 60 fps with fixed focus on one spot. 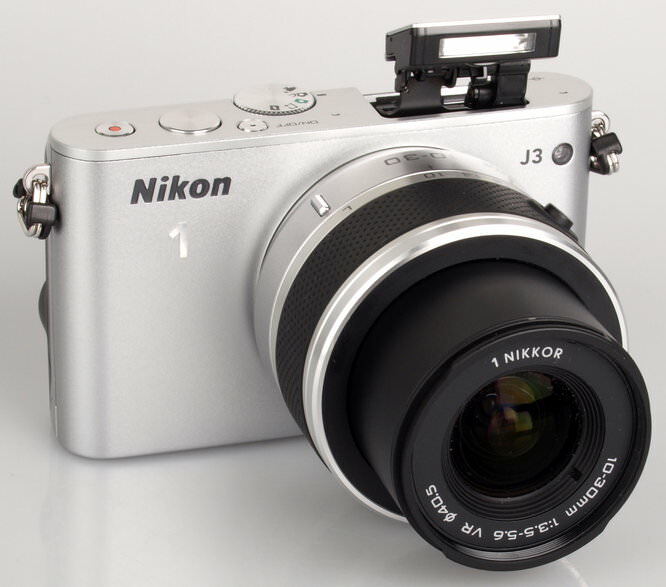 The J3 offers some of the unique features you'll on find on Nikon 1 cameras. Live Image Control lets you view the effects of changes to exposure settings in real time and Slow View takes up to 20 continuous shots and shows them in slow motion, you can then choose the exact moment you want to take a shot. Smart Photo Selector will take a number of pictures and will save the best 5 based on an algorithm, using information such as blinking in portraits to determine the best ones. Motion Snapshot takes a slow-motion movie just before you press the shutter. There is the Creative Mode as well as PSAM shooting. You can also shoot panoramas using a sweeping method. Videos are recorded in full 1080p HD and you're able to shoot full resolution 3:2 images during recording. There is an Advanced Movie Mode for smooth autofocus transitions and you can also use PSAM controls to set the shutter speed and aperture, as well as record slow motion videos. If you already own any Nikkor lenses you can purchase the FT1 mount adapter to use these on the J3, if they are AF-S Nikkor lenses you can still use autofocus, other lenses are manual focus only. To transfer images to a smartphone or tablet there is the Wireless Mobile Adapter WU-1b which can also be purchased separately. There is also a GR-N2100 Grip and WP-N2 Waterproof Case. 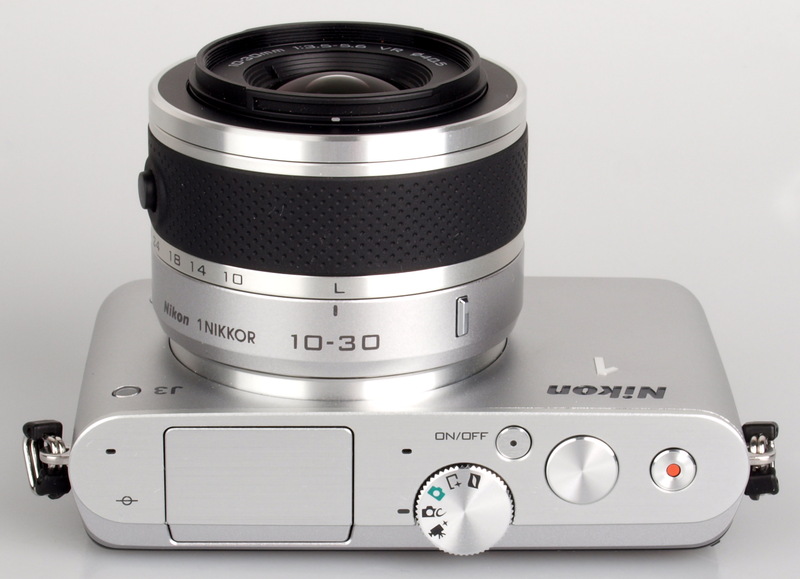 The Nikon 1 J3 has a very compact aluminium body. It's not small enough to carry in your pocket, but a small camera bag, such as the Manfrotto Amica 10 would do fine. The 10-30mm has a rubberised loop around the lens barrel to aid grip and the lens can be compacted when not in use. 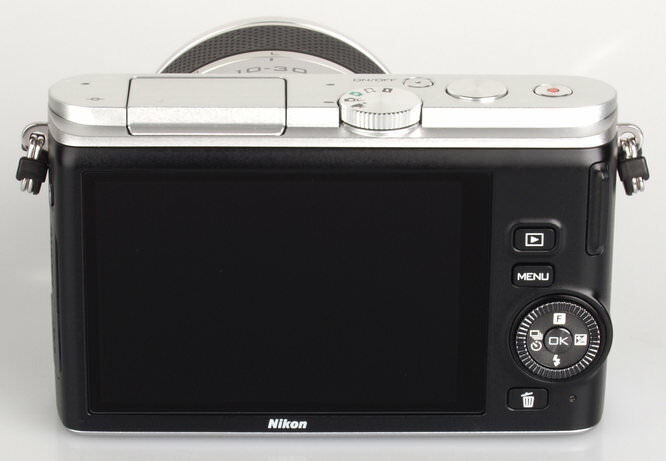 There is a button to release and lock it, when released the camera will switch on, when compacted back, it switches off. The J3 has a menu button on the top, alongside the on / off button, shutter release and movie record button. On the rear are playback, menu and delete buttons as well as a rotating wheel for cycling through the menus. The rotating wheel can also be used as a d-pad giving access to the self-timer, continuous shooting, flash, exposure compensation and function which gives access to different settings depending on which mode you are using. On the left hand side of the camera is a button to release the pop-up flash. The 3 inch screen has a decent 921k resolution and is bright and clear to view in varying light. The J3 has well laid out menus that are easy to navigate, although instead of utilising the menu button, the PSAM modes are accessed by using creative mode via the function button. Battery life is rated at 220 shots according to CIPA test results, this is quite short so you may want to consider purchasing a spare. We took a number of shots to test the camera's responsiveness, from switch on to first photo, shot to shot, focusing speed etc. We take a number of shots and then use the average to ensure accurate and consistent tests, making it easy to compare with other cameras. Continuous shooting speeds are very similar whether shooting in JPEG or RAW, with all of the modes shooting in full resolution. Sample Photos - The Nikon 1 J3 takes well exposed images with decent colour reproduction. Portrait shots have excellent skin tones and are free of red-eye when using the flash. Lens Performance - Images have a good amount of detail when shooting at both ends of the lens, there is a little softening in the corners, with a good control over purple fringing in contrasting areas. When using the lens at its longest length it's possible to take impressive macro shots. ISO Noise Performance - Noise is low between ISO 160 and 800. At ISO 1600 noise causes significant softening of the images and are even softer at ISO 3200. At ISO 6400 detail suffers and a poor image is produced. White Balance Performance - There is a slight colour cast when using the AWB (auto white balance) under the incandescent lighting, with the incandescent preset performing slightly better. Under the fluorescent lights, the AWB performs really well, there's a magenta cast when using the fluorescent preset. Panorama mode - Panorama's are automatically stitched together by the camera. Both detail and stitching is good. Digital Filters - There are some special effects within the creative mode, there are examples above. Smart Photo Selector (SPS): Flash is not available, so ideally you would need good light for this, although the camera will increase the ISO setting when needed. The camera takes 30 photos at 30fps and then presents the 5 best photos, with one of the photos highlighted as the best overall, all 5 photos are saved to the memory card as JPEG or RAW if selected. The Motion Snapshot or "Living Picture" as Nikon like to call it, takes 1 photo, and 1 slow motion video - (1 second long) and then when played back on the camera it plays the video then shows the photo with one of four pieces of music (chosen pre-shooting). The files are saved on the memory card as an 12 megapixel JPEG (4608x2592), and as a separate 1080/24fps MOV video file, both files have the same name, both starting with NMS and the JPEG ending in .JPEG, and the video file ending in .MOV. An example video can be seen here. Flash is not available. Video - Video is recorded at 1080/60i, 1080/30p, 720/60p and 720/30p, with stereo sound, video sound options are: auto sensitivity, high, medium, low and off with the option of wind noise reduction on or off. Below is a video recorded in 1080/60i. 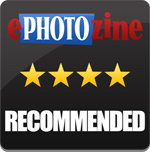 Video quality is good, you'll find a video recorded using the zoom on the ePHOTOzine Youtube page. Slow motion options are: 400fps (640x240) or 1200fps (320x240) the later mode needs better than indoor lighting. Both of the slow motion video modes can only record 5 seconds, and examples of all of these video modes are available on the ePHOTOzine Youtube page: High speed 400fps, High speed 1200fps. The Nikon 1 J3 is available with the 10-30mm kit lens for around £530. Other entry-level mirrorless cameras to consider include the Samsung NX1000 with 20-50mm lens at £260, Sony NEX-3N with 16-50mm lens at £325, Panasonic Lumix DMC-GF6 with 14-42mm lens at £479, Pentax Q10 with 5-15mm lens at £377, Olympus E-PM2 with 14-42mm lens at £404 and Canon EOS M with 18-55mm lens at £398. The Nikon 1 J3 has a solid metal body and is one of the more compact mirrorless camera systems available, thanks to the small kits lenses available being very compact thanks to the pancake design and collapsible zooms. 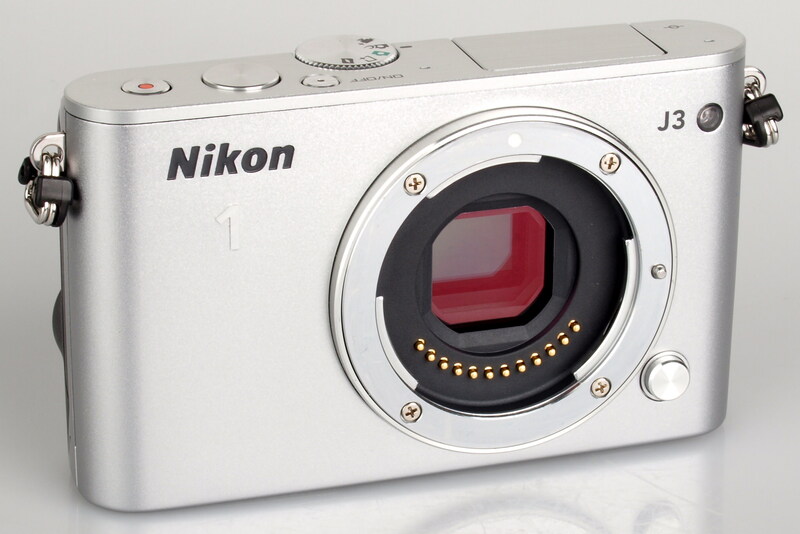 The Nikon 1 J3 is smaller and lighter than its predecessor, yet still offers high performance.